What makes the Alabama Shakes sound new is that they’re evidently devoted to their musical forebears -- everyone from Etta James and Aretha to Bowie and Zeppelin -- yet also coquettishly unfaithful to each one of them. Revivalism is hip right now in music; what’s more, it's insanely profitable. Retro rules the current Billboard Hot 100, where Mark Ronson's record-collection-pilfering "Uptown Funk" sits alongside Maroon 5's lite-funk ditty "Sugar", while Ed Sheeran's baby-making crooner "Thinking Out Loud" may be just as ripe as "Blurred Lines" was for a legal challenge by Marvin Gaye's estate. Each of these songs feels a little cheap for how luxuriantly polished it is; "Uptown Funk" could teach a master class in studied calculation, as each bass note and doo-wop vocable feels as squeaky-clean as the stretch limo featured in the song’s music video. 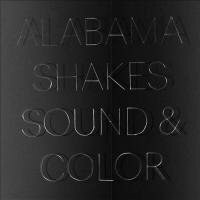 The critically lauded Alabama Shakes, who return this week with their second LP Sound and Color, sailed to popularity a few years ago on similarly retro-happy winds. Brittany Howard's soulful, bluesy voice sounds like a dispatch straight out of 1970s Muscle Shoals, or maybe a '60s jazz club or a Thriller-era Michael Jackson record... Suffice it to say that Howard's voice, like the band's entire sound, is nearly impossible to categorize, demanding genre-limning hyphen after hyphen until a music critic might as well throw them all away and try to say something original. If the Shakes' debut Boys and Girls proved difficult to categorize, then Sound and Color ups that ante even higher, adding doses of psychedelia, punk, and lengthy jamscapes to the band's already heady musical cocktail. While the chart-topping tracks mentioned above give off a gaudy sheen in their calculated ideation and production styles, each passage on Sound and Color feels organic, like it pushed its way out of southern soil or floated into someone's mind on a back porch breeze. This isn't to say that there's anything messy about these new offerings; rather, one almost feels the shape of each song morphing and modulating as the band plays it through. "Gimme All Your Love" is a perfect example: the first few verses and choruses alternate between slow-burning R&B and a skittering punk rhythm, almost as though the song is inhaling and exhaling itself, until the time signature changes in the final third, kicking things up and bringing those two dynamic extremes together over additional guitar parts and resonant organ chords. Other songs are built on similar movements between furious punk-rock onslaughts and retractions into spare, tiptoeing keyboard or vibraphone lines, traversing the sonic spectrum from Curtis Mayfield territory to something you’d hear in a D.C. or Seattle basement circa 1980. Partial credit for Sound and Color's tonal variance should go to producer Blake Mills, who's worked with a diverse range of artists including folk stalwart Conor Oberst and goth-pop starlet Sky Ferreira. While Boys and Girls turned ears thanks to Howard's supersonic vocal and the band's blues-rock sound, that album was limited by occasionally ham-handed production that allowed simplistic percussion too much free rein. The last half of "I Found You", for example, got bogged down by repetitive eighth notes with nary a backbeat to be heard, resulting in a head-pounding relentlessness that overshadowed the flexible groove driving the song up to that point. That oversimplification is virtually gone on Sound and Color; rather, the percussion is softened where it needs to be, and the songs' gear switches sound effortless and nimble. The star instrument on Sound and Color, undoubtedly, is Howard's voice, which has found lofty new heights thanks to her more frequent departures into falsetto. Adding almost a whole new octave to her trademark husky alto, Howard's vocal here is able to express a panoply of emotional states, from self-protective diffidence to outright rage. Studying "Feeling" alongside "Don’t Wanna Fight" proves the point: on the former track, Howard's falsetto flickers above a simple guitar line and hand-drum patter while she implores, "So please don’t take my feeling / I have found a life." It's astonishing that Howard and her band can pull off that kind of restraint just a few tracks after "Don’t Wanna Fight", on which Howard's exasperated wail gives way to ferocious alto inflections, fitting for a song that conveys frustration about constantly having to fight unfavorable circumstances and inflexible people in order to gain a modicum of peace. Howard's texture is matched perfectly by the instrumentation, where each guitar and bass note bends and reverberates with an apt roughness. This deep into the genealogy of rock music, it might be impossible not to sound retro in one way or another. But what makes the Shakes new is that they're evidently devoted to their musical forebears -- everyone from Etta James and Aretha to Bowie and Zeppelin -- yet also coquettishly unfaithful to each one of them. They bow down then turn away from one moment to the next. Anchoring the whole affair is a palpable infatuation with that freedom, a conviction that each beat can contain the past, present, and future all at once.